Rafiq Maqbool’s picture of an Afghan man offering tea to a soldier is a fantastic rendition of the truth behind the essence of humanity. 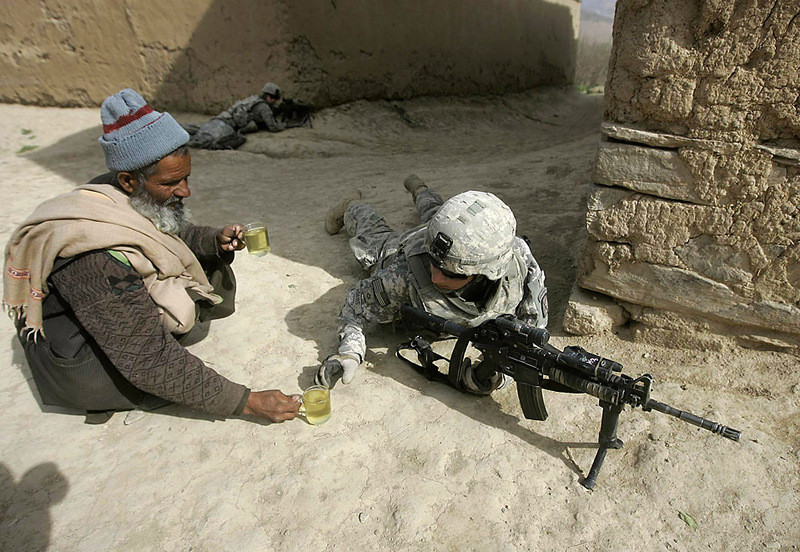 The photograph was taken while an Afghan native served tea to a soldier from the US Third Brigade on the 10th Mountain Division patrol during a search operation to hunt members of the Taliban in Nerkh District of Wardak Province in West of Kabul, Afghanistan in May 2009. The Silk Route, as Afghanistan has often been called, has been the subject of The Great Game, making it a historical battle-magnet of sorts. Afghanistan was always the passageway for the world’s greatest actors in their pursuit from the Occident to the Orient – be it for the Silk Route when civilization just began, or in The Great Game during the colonial eras, or for the many proxy wars that would be fought in years to come. Much of Afghanistan’s ancient history lies in conquests and massive grandeur in a world of Kings and Empires. No stranger to war, Afghanistan has been a hotbed of conflict for decades now. In the duration of the war, Afghanistan’s people have come under scrutiny and have often been stigmatized tremendously. Given that the nation’s socio-political landscape is fraught with warlords and violence, peppered with terrorist activity, Afghanistan’s civilians and ordinary people have seldom been given a chance to speak their minds and thoughts, much less be heard for what they envision for their country. Against this backdrop, Rafiq Maqbool’s picture is a gentle nudge in the direction of deconstructing the dehumanization. It is a touching moment that captures a simple fact: that the people of Afghanistan transcend war, conflict, their own fears and uncertainties for a future. A simple act of serving tea might have precious little symbolism in an everyday living: but in this photograph’s context, there is an importing of humanization, a sense of bond-building and camaraderie that cuts across borders. To the Afghan man, he is but tending to what his culture teaches him, for a guest is a guest, and is valued, cherished and welcomed, no matter who he is. To the US soldier, the Afghan man is the face of the country he was sent to help. Let’s step back from politics and leave the condescension out of the picture (that the soldier should not be considering himself a savior of a community that is capable of deciding its own future is a very different line of thought that falls beyond the needs of our current conversation). And what do you see? Two people. Two cultures. Two circumstances. Two realities. One bond. Photographs that changed the world, Photography buy high quality images, buy royalty free images, buying stock images.